She loves networking, making connections, and creating opportunities – and I know that is a big fear for a lot of people, but it’s also a necessary part of being a lifelong learning and, increasingly, growing your career. So, why do so many people hate the word networking? I blame it on most people’s mothers, and then most people laugh at me. But what did your mother always tell you? Never talk to strangers! And when most of us think about networking, we think of talking to a group of strangers. But a stranger is somebody with a bottle of Mogen David at the Ohio Stadium looking at a lamp post going, “Oh, you’re awfully tall.” That’s a stranger. But in a business environment, people that we don’t know are opportunities. You don’t even have to get face-to-face with real people to get started! One of Cara’s mentors, Mike Taylor, once said during a presentation that Twitter is the number one professional development tool. She signed up for Twitter during his presentation and, fast forward to 2019, she uses Twitter daily to talk to people all across the world that do the work and have the same challenges that she does. People that embrace that growth mindset won’t just have a better network – they’ll be better positioned over the next 10 to 15 years, as our workplaces evolve. “You’re going to have to have a growth mindset to stay malleable and employable,” and that’s true in pretty much every industry, but it is especially true for CPAs. As we’ve mentioned before, CPAs will need more than just technical skills to thrive in the coming years. So what are your next steps in becoming a better networker? Is it changing your mindset? Is it not sitting or standing with your office friends and meeting new people? Is it breaking through your shyness and comfort zone to explore possibilities? What do you need to do? And where could you get out of your comfort zone? I challenge you to start by just taking 10 minutes, writing down some ideas – But the key here is follow through. Whatever you come up with, just do it! Cara North: [00:00:00] My depth of knowledge has expanded more than somebody that has been doing the same old thing for five years or ten years because, Peter, it’s so important for your growth to constantly be getting feedback. 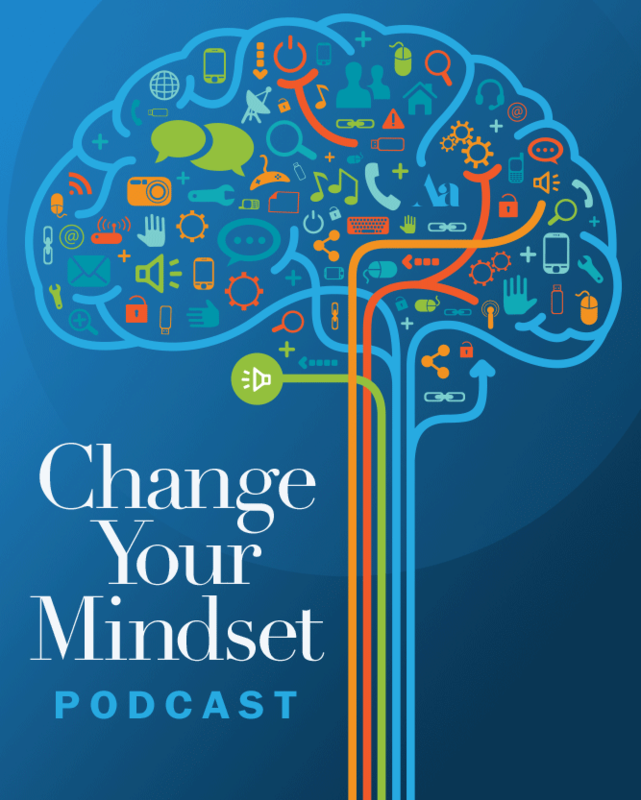 Peter Margaritis: [00:00:14] Welcome to Change Your Mindset Podcast, formerly known as Improv is No Joke, where it’s all about believing that strong communication skills are the best way in delivering your technical accounting knowledge and growing your business. An effective way of building strong communication skills is by embracing the principles of applied improvisation. Peter Margaritis: [00:00:45] Your host is Peter Margaritis, CPA a.k.a. The Accidental Accountant, and he will interview financial professionals and business leaders to find their secret in building stronger relationships with their clients, customers, associates, and peers, all the while growing their businesses. So, let’s start the show. Peter Margaritis: [00:01:11] Welcome to Episode 25. And my guest today is Cara North, who’s a learning experience designer at THE Ohio State University. She’s also the President of the Central Ohio Chapter of the Association for Talent Development. Now, I did not invite her to be a guest on this podcast because of her day job. I invited her to be a guest because, as she says, “I love connecting others to people and opportunities.” She loves networking, making connections, and creating opportunities. Peter Margaritis: [00:01:41] Now, I know a lot of you hate networking, and Cara will help to change your mindset. When people tell me that they hate networking, I tell them I blame their mothers. They get this really weird look on their face. Then, I say, “What did your mother always tell you? Never talk to strangers.” Well, there are no strangers in business gatherings. There’s only opportunities. Cara shares a number of tips and techniques on how to approach networking with a positive mindset. Peter Margaritis: [00:02:13] So, before we get to the interview, I want to share with you, if you haven’t heard already before the previous other episodes, that Change Your Mindset is now being distributed on C-Suite Radio. You can find Change Your Mindset and many other outstanding business podcasts on C-Suite Radio by going to www.c-suiteradio.com. Announcer: [00:02:34] This podcast is part of the C-Suite Radio Network. Turning the volume up on business. Peter Margaritis: [00:02:39] Other than being the host of this podcast, I’m an author, a public speaking coach, and a professional speaker. My clients consist of accounting firms, finance and accounting departments, associations and Fortune 500 companies. I’ve worked with Sales Team, C suite teams, engineers, and accounting and finance teams. Peter Margaritis: [00:02:59] If you’ve been listening this podcast for a while and think that I could add value as a speaker to an upcoming conference, please contact me at peter@petermargaritis.com and put it in the subject line, CYM Speaking Opportunity. Now, let’s get to the interview with Cara North. Peter Margaritis: [00:03:25] Hey, welcome everybody. I got a very special guest today, my dear friend that we go back a whole, maybe three, four, five months something like that. Please welcome Cara North. And thank you so very much for being a guest on my podcast today. Cara North: [00:03:43] Oh, it’s a pleasure, Peter. Thanks for having me. Peter Margaritis: [00:03:46] I’ve been looking forward to this. Cara and I met through a mutual friend and we have to give a big shout out to Eddie Turner. So, Eddie, I hope you’re listening because your magic of networking is as strong as ever because we’ve actually kept in touch. We’ve met — as I said in the bio, Cara is the president of the — is it Central Ohio or Columbus Chapter of ATD? Cara North: [00:04:14] It’s Central Ohio, Peter. Peter Margaritis: [00:04:15] That’s right because just Columbus itself is not big enough. We will get to stretch it out to the Greater Columbus area. And ATD, for my audience who may not know, what does ATD stand for? Cara North: [00:04:31] It’s the Association for Talent and Development. You may know this, they actually used to be a – I think, I want to say 5-6 years ago – ASTD. But for obvious reasons, they dropped the S.
Peter Margaritis: [00:04:44] Yes. It felt like you need to get a shot of some kind to attend to meeting for them, yes. And you met Eddie at the National Conference in October I believe? Cara North: [00:04:58] Yeah. I was in Washington DC, and it was for all ATD chapter leaders. And I’ve been following Eddie on LinkedIn for a little while. He used to be President of one of the biggest chapters and the gold star of chapters NATD. And when I saw him walk by, I was like, “It’s Eddie.” And so, I went up to introduce myself to him, and I’m really glad that I did, and that kind of sparked our friendship. And then, he invited me to come to the NSA conference that you guys had. And that’s how I met you, Peter. Peter Margaritis: [00:05:31] Exactly. And coming to find out we have a lot more in common than just Eddie. We’re both from the great State of Kentucky. Cara North: [00:05:38] Yes. Kentucky Wildcats. Peter Margaritis: [00:05:41] Exactly, that’s right, and graduated from UK. And it’s been a pleasure to get to know you. You’re very fascinating because — and I’ll have people, I’ll ask you to give your background, but you’ve got so many different facets to what you like to do. And if anybody wants to know, what I mean is go to Cara – and that’s C-A-R-A – North’s LinkedIn page and read her introduction, and you’ll go, “Oh, yeah, this is kind of cool.” I’m not going to read it for them. I’m going to let them go and do that themselves. And, hopefully, the people, your views, you’ll get a report saying you got 250 new views this week. That’s just for me because I’ve done it a couple of times, reread it, and stuff but. So, give the audience a little bit about your background. Cara North: [00:06:33] Sure. I grew up in eastern Kentucky. So, I’m very proud of where I grew up, and my family still lives there. And I was one of those kids, I didn’t really know exactly what I wanted to do. At one point, I wanted to actually be a neurologist or neurosurgeon because I had a pretty significant horse accident when I was younger. And after that, I thought that that would be a great way to kind of give back after I recovered from this horse accident. But long story short, I found out there’s this thing called chemistry you need to go through. Actually, another little side note is I have an eye phobia. I’m afraid of eyeballs. So, I figured that probably wouldn’t be good for me to become a doctor. Cara North: [00:07:16] And so, before I went to college, I kind of had – I want to call it a pre-quarter life crisis as a teenager trying to figure out what I wanted to do with my life. And I really thought about it, and I said, “I really like creative outlets. I like storytelling. I like writing. So, what can I do with that?” And then, that’s how I decided to go to the University of Kentucky and get a degree in Journalism. Cara North: [00:07:43] And after I graduated undergrad, this amazing thing called the recession happened. Yeah, not the best time to graduate undergrad. And I’m the first person in my family to go to college and graduate. So, my family was very supportive and proud of me. And I was really embarrassed because I couldn’t find a job, and I thought there was something wrong with me. Cara North: [00:08:05] So, I ended up moving back home to Eastern Kentucky, to live with my parents. I haven’t been there more than like a week, two weeks, something like that. And my parents actually got a newspaper subscription. Yes, old school newspaper. Cara North: [00:08:19] And it had a help wanted ad saying that there were open interviews at a call center in Huntington, West Virginia, which was pretty close to where my parents live, on the border of Kentucky and West Virginia there. And I’m a firm believer that anything beats zero dollars an hour. So, I went to the unemployment office, and I had my open interview, and I walked out of there with a job. Cara North: [00:09:22] So, this role they promoted me to was a call center quality analyst. And in this role, what I would do is I would coach people on the phones about scripts and different standards of the company. And long story short, one little tiny, tiny, tiny element of that was I got to train the new hires on the procedures. I was like, “Huh, that’s interesting.”. Cara North: [00:09:45] And I’ll never forget, and this is 100% true story, the first time after I delivered my first training — well, first of all, I didn’t know what I was doing. I mean, straight up, I didn’t know. Second, when I asked about it they said, “Oh, you have kind of creative range to figure out how you want to share this information.” After I did it the first time, I’m sure it was absolutely horrible, I walked away and I said, “That’s what I want to do the rest of my life. I love that. I love that.” Not necessarily at that place but I knew I like training. Cara North: [00:10:17] So, I stayed there for about another year. And as I stayed at the center, a lot of people were leaving that center to go work at another call center that they had just built right across the mountain for amazon.com. And they said, “Cara, you need to come over here. This is great. We keep talking about how great of a trainer you are and how good you are.” And long story short, I got an offer to come over to Amazon. Cara North: [00:10:45] So, I started working at Amazon in the Kindle department. And at that time, it was just the second generation Kindle moving into the third generation Kindle. So, it was still kind of a newer product. It was still pretty expensive at that point for that particular product, and I really liked working there. Cara North: [00:11:03] And one day, I asked my manager who makes the training material because the training material was not fitting the needs of the new people coming in. We were seeing a shift in more of providing product support to actually like more kind of holistic support. And that happened when the Kindle went from having built-in data capabilities to WiFi only. And so, people just saw that the price went down by 100 bucks. Peter Margaritis: [00:12:12] Oh, wow. Peter Margaritis: [00:13:28] Yes, it does. Cara North: [00:13:29] That’s how I got my job at Amazon as an instructional designer. And that’s where I got my formative experience in learning training and I loved it. I really had a great time in that job. But the one thing that I miss the most was I was behind a computer all the time building stuff. I didn’t have that human interaction anymore, and I miss that. So, I ended up starting to work at an adult education center in Huntington, West Virginia as well to help adults that were looking to get back into the workforce, get computer skills, help them get back on their feet. And I loved that job. I absolutely loved it. Cara North: [00:14:02] So, here, I was doing Amazon. And then, I did the workforce development center. In about 2013, I fell in love with a guy in Ohio, and I had a decision of what I wanted to do, and I ended up moving to the Columbus area, and I got a job here at the Ohio State University. Then, in June I’ll be here for six years. Cara North: [00:14:24] Yeah. So, I’ve been working at Ohio State for six years now. And one thing I love about Ohio State is, spoiler alert, you get free tuition when you work here. And that was definitely a selling point for me because I fell into this profession that I love so much, I wanted to go in and backfill my credentials. So, in 2015, I earned my Master’s here in Workforce Development, and I’m on track to earn my PhD in Learning Technologies in the next couple of years. Peter Margaritis: [00:14:51] Yay for you. So then, I’ll have to call you Doctor. Cara North: [00:14:55] No, I’m just Cara. Peter Margaritis: [00:14:56] Yeah, Dr. Cara. Cara North: [00:14:56] No, just Cara. Just Cara. Peter Margaritis: [00:14:56] Just Cara. And isn’t it — it’s not the Ohio State University. It’s The Ohio State University. Peter Margaritis: [00:15:03] You got to put that little bit of a pause in there, The Ohio State University. Cara North: [00:15:07] It’s funny you say that. When I was interviewed here, that was actually one of my questions because it was asked, “Do you have any questions for us?” I said, “Why is it called The Ohio State University?” And the person on my panel said it stands for tradition, history, and excellence. And I don’t know if there’s any truth, but that’s what I was told. Peter Margaritis: [00:15:28] Oh, that’s — my Ohio State fans, if you’re listening to this, send me an e-mail. Let me know if Cara just uncovered something that none of us knew about. And I assume it’s true. That’s pretty cool. So, the thing about you, and you’ve said it already, is your curiosity. A lot of people, curiosity will stop them from doing something. It’s that fear of failure. You embraced curiosity in a different way of it’s just you never know what’s going to happen, you never know what door this is going to open. Cara North: [00:16:07] Yeah, absolutely. And I love that you brought up the fear of failure. I am the opposite of that. I embrace failure. I want to fail. I want to fall on my face. I want to get feedback. “Hey, Cara, that was horrible,” because I’m going to have a pen and a paper, and be like, “Okay, what can I do to improve it? What can I do to improve it?” Because in this profession that I’m in, I take learning very seriously because when I ask for somebody’s time to learn something, and I haven’t been keeping up with kind of learning and growing myself, I find that highly hypocritical. Cara North: [00:16:44] And honestly, I feel like it’s my job to be a lifelong learner and actually embrace that. And I work at a university. I have no excuse in my mind to continue to grow, and learn, and innovate. So, I’m really, like I said, fortunate to work here at the University. They’ve been very, very good to me, very supportive of me in my career. And, again, when I’m done with my doctorate, I don’t know. I don’t know what’s next for me, and I’m okay with that. I’m okay with not knowing right now. Peter Margaritis: [00:17:13] The ability to embrace failure is very unique in so many ways because most people — and I was raised by — my father did not like mistakes. He didn’t like failure. But as you well know, and we all well know that the only way to learn is to fail. And I’ve said this a number of times on the podcast. I may have even mentioned it to you when we had lunch that day. I don’t remember who it was that said, “If you look at the word fail, and make it an acronym, it stands for first attempt in learning.”. Cara North: [00:17:46] I love that. Cara North: [00:18:31] Yeah, absolutely. And I think you hit on a lot of important points there. For me, especially, I want to be around people that are smarter than me. That is why I strive for in my network. That’s what I strive for in my work life. It’s what I strive for just for me to grow because, again, I’m 100% okay, no ego saying, “I don’t know everything.” That’s fine. I don’t pretend to know everything. In the profession I’m in, there’s no way you can be an expert, in my opinion, in everything. But I know if I get a question about X, I have someone in my network that can help me understand it. I can contact a mentor of mine, et cetera. Cara North: [00:19:14] So, for me, it’s not about just like only my brain, but it’s like if you work with me, you don’t just get me, but you get my network. And I think that’s so much more powerful to an employer. I think it’s so much more powerful to the individual because, again, it’s all about a high tide raises all boats. We’re all in this together. We all want to do better. Everybody wants to feel valued. Everybody wants to be respected. And I feel like collaboration is the best way to do that a lot of times. Peter Margaritis: [00:19:46] So, why do so many people hate the word networking? I know, I hate network. I like to network. And I come, I blame it on their mother, and they laugh at me, “What do you mean blame it on my mother?” I said, “Well, your mother always told you, never talk to strangers.” And when we think about networking, there’s a bunch of people, “I don’t know. They’re strangers.” No, a stranger somebody down at Ohio State with a bottle of Logan David at the Ohio Stadium looking at a lamp post going, “Oh, you’re awfully tall.” That’s a stranger. But in a business environment, people that we don’t know, that’s an opportunity. Cara North: [00:20:26] Absolutely, yeah. And for me especially, I think networking really kind of became important to me when I actually moved to Columbus. When I worked at Amazon, I was very well supported, and I didn’t realize how good I had it until I left. That’s not to say that I haven’t stayed in contact with the people that I worked with, but it’s not like I could just send instant message to somebody to ask their opinion or whatever. Cara North: [00:20:54] And I really struggled, probably, my first two years when I moved to Columbus. You can ask my husband. I just really — I just wasn’t myself. I really struggled with my identity, and who am I, and everything. And then, I just decided one day, I said, “This is ridiculous. You have a lot to offer. This is something that you can get better at.”. Cara North: [00:21:16] And so, that’s how I got involved with Central Ohio ATD. I actually saw an event posting where I had followed that person that was speaking. His name is Mike Taylor, who happens to be a mentor of mine. And at that session, he was sitting there. And this was in March of 2016, I remember it. I went, and he made a comment saying that Twitter was the number one professional development tool. And I sat there, and I was like, “Boy.” I was like, “Who cares? Who cares about Twitter?” But the more he talked about it, and he showed relationships that he had built with people, and how these people that were writing all these really thought-provoking things about the profession that I’m in, how he can just send them a tweet, and they would respond back. I was really kind of intrigued by that. Cara North: [00:22:06] So, finally, toward the end of his presentation, I was sitting there. And I signed up for Twitter in his presentation. Afterwards, I told him, “Hey, I just want you to know I believe in what you’re saying. And I just signed up for Twitter, and I want to learn more about your process.” And he taught me his process. And fast forward to 2019, I use Twitter daily to talk to people all across the world that do the work that I do, have the same challenges that I do. Cara North: [00:23:25] You say that, you really limit your opportunities, again, to grow. And if you want to learn, you have to kind of challenge your own boundaries, and make yourself feel a little bit uncomfortable to grow. And people that have that mindset, I don’t think that they’re going to be well positioned in the next, especially, 10 to 15 years in the workplace because I think there’s big, big changes coming soon that I think will impact that deep level expertise. You’re going to have to have a growth mindset to stay malleable and employable. At least, that’s my prediction. Peter Margaritis: [00:24:01] Yeah. I saw a meme once that said, “Your comfort zone is where all your dreams go to die. Get it outside your comfort zones. That’s where all your dreams come true.” But we’re so fearful. It goes back to risk. It goes back the fear. It goes back to fear of failure on why we don’t stretch ourselves at times, and when we stay in that comfort zone, and we don’t try to get out of it. Cara North: [00:24:56] That’s right. Peter Margaritis: [00:24:58] Yeah. Somebody asks me, I like to talk about myself. But there’s times that I go, and I go, “Tell me about you.” And just let them talk. And then, I can gather all this information and figure out what I’m going to say when it comes my turn, and I don’t have to lead that conversation. And so, you’ve talked about networking through Twitter, you network through LinkedIn, you network face to face. You’re doing all of that. And it grows your career at a much quicker rate than doing it by yourself. And when you look at the President of Ohio State, you look at the governor, you look at the president, you look at CEOs of major organizations, they didn’t get there without a network of people. Cara North: [00:25:42] True, absolutely. Peter Margaritis: [00:25:45] So, the more people that you know. So, we’ll go back to Eddie. I’ll come back to Eddie here in a second, which made me think about — well, Eddie, he introduced us and said, “You guys-” We came to the meeting, we talked for stuff, we said that we’re going to connect. There’s another gentleman. His name was Merle Heckman. Merle is out of out of Northern Kentucky. He’s an organizational development guy. He’s a member of the National Speakers Association. Cara North: [00:26:46] Yeah. And the term mentoring and the way you make connections with people. One thing that I’ve heard many people say that I don’t necessarily agree with is a mentor should be like senior to you or have like whatever. I think mentoring should be a mutually beneficial relationship. So, even if somebody has a little bit more experience, why can’t you learn from that person you’re junior on how to approach a certain problem, or how to use a new technology, or how to do whatever. Cara North: [00:27:18] And I think that by having these kind of informal chats over breakfast or having somebody introduce yourself, it really, also, kind of keeps, I think, the egos in check a little bit. So, it’s not that somebody is bringing their title to that conversation. It’s more, “Oh, you know X. Because you know X, then I trust X’s opinion of you.” So, it’s like you don’t have to have that clash and battle of the titans that I think a lot of people kind of get caught up in sometimes. And again, “Oh, I’m going to call you Dr. North or Dr. Cara,” it’ like, “No, I’m just Cara.” I’m doing it because I love to learn, and I love knowledge. I’m not doing it for any other reason except that. Peter Margaritis: [00:28:03] Yeah, yeah. And you said the magic word, “ego.” And ego gets in the way a lot of times when you’re networking because, “I’m so important. I know this much and that much.” It’s like you do, but you’re also a human being. And we all put out our pants and put on our skirts in the same way. So, why can’t we drop the ego and say, “What can I learn from this individual?” We’re not going to connect with everybody. Peter Margaritis: [00:28:28] There are some people that I’ve met that I have a hard time maintaining a conversation with. But then, there’s some people, like yourself, that we will get to meet like 30 minutes for lunch, and it was like an hour and a half later, and you got to get back to work.” And I went, “I’m self-employed, so I can be able to goof off for the rest of the day,” but it was just great conversation. Peter Margaritis: [00:28:50] And same thing the first time I met Eddie. A mutual friend, Bob Dean, had mentioned, “You really need to meet this guy,” and connected us through social media. But we finally had a chance to meet, and another great guy. It’s just the power of networking, if people want to understand, there is a lot of power in the people that you know that can get you to where you need to go, and you have a resource, especially if something shows up, and you lose your job. Cara North: [00:29:43] Yeah. And I think that’s really solid advice. And it’s not — Unfortunately, I feel like in this day and age, it’s not if but when. I mean, everybody, unfortunately, we are replaceable. And being able to make sure that your resume is up to date, that you’re up to date in the skills and whatever your profession are. I mean, it’s absolutely critical because you just never know. I mean, you just never know. Peter Margaritis: [00:30:11] You mean, instead a résumé, keep your LinkedIn profile up to date? Cara North: [00:30:15] Oh, yeah, of course. Peter Margaritis: [00:30:18] Yeah. So, as I share with you, I don’t have the exact stats on this, but I think that vast majority of my audience are CPAs. And this time of year, they’re busy. And they don’t have time to work on the network. However, come April 15th when the CPA sees its shadow, busy season’s over because you actually see sunlight again, they need to start working on that network almost, to some degree, on a daily basis. And networking is also networking within your organization too. Cara North: [00:30:56] Sure. And maybe one thing that they could potentially do is even though your client is not a fellow CPA, your client can help bring you more business more than likely. So, I mean, just even something like after the end of the season, just sending a quick note, a message, whatever through either Twitter or LinkedIn, however you’re connected with your client saying, “Hey, well, we made it. Thanks for choosing me. Would you recommend me to somebody else? Is there anything else I can do?”. Cara North: [00:31:24] And, again, constantly getting feedback on your services, the way you present yourself. People, a lot of times, if you ask for candid feedback, they’ll give it to you. And you have to be ready to take it. But with that being said, if somebody thinks that about you, they’re probably not the only person that does. So, if you need something like that, think about maybe what it might mean in the bigger scale of things. Cara North: [00:31:51] Because for me, I have gotten feedback a lot of times that I am way too hyperactive and energetic in whatever it is that I’m doing like if I’m doing a presentation. And I know this, and I try to keep it in check a lot of times, but I love what I do. I genuinely love what I do. And it comes across, a lot of times, as just being hyper. But I promise, I think, it’s passion most of the time. But knowing that about myself, I’ve had to be a little bit more careful in the way that I present myself at industry events and that kind of thing. Peter Margaritis: [00:32:29] I’ve always thought since I’ve known you that you really kind of a mellow, kind of laissez faire type of individual. Yeah, that’s sarcasm. Cara North: [00:32:38] I have to say, what? Peter Margaritis: [00:32:38] Yes. But, yes, you do have a lot of passion, but you’re willing to take that feedback. A lot of people — and I watch this. I think we’re all guilty of this to some degree. We’re getting feedback from somebody, and then we get defensive, and we start kind of making excuses why or giving rationale why when that’s really not what we should be doing. We should just be taking it in and nothing personal, especially if you solicited it, and just park it, and figure out, “What? Okay. So, okay.” And like you said, maybe if one person says it, there’s probably going to be a few more. Ask. Cara North: [00:33:19] And one thing that I do because, again, I’m telling you this, but it’s easier said than done a lot of times, I certainly had my feelings hurt, and I’ve been defensive a lot of times about some of the feedback that I’ve gotten. But luckily, for me, I have two people, in particular, in my network. One that’s known me for about three years, and one that actually worked with me at Amazon. And both of them are just very objective people. They have the gift of seeing more than one side, and they never take sides on things. Cara North: [00:33:52] And so, when I get stuff like that, I’m calling both of them up and saying, “Hey, guys, I got this feedback. Can you help me unpack it and make sense of it to me?” And every single time, they say, “Well, they probably meant this. And when you did this, it was received as this. And have you thought about this?” They helped me see that vision that I don’t see because we’re human. And a lot of times, especially when it’s something about ourselves, we do take it personally, right? Cara North: [00:35:09] And it took me a while to get there. Again, this is something that just didn’t happen. It took me a long time to get there because, immediately, I would have that defensive reaction to it like, “Well, who are you? Who are you telling me this? What are you doing?” But then, I realized that my plan and where I’d like to go, I love meeting people in this profession. I love continually presenting and talking about things from our practice perspective. And I knew I was going to go nowhere fast if I had thin skin. I had to toughen myself up. And by doing that, and by identifying, again, values that I have in my network that I certainly don’t have, and lean on them for support, it’s really helped me. Peter Margaritis: [00:35:58] Yeah, it does. And very lucky to have that. As you were saying, I was trying to think of the people who I would turn to in a situation like that. And so, I think, after this podcast, I need to sit. Other than my wife, sit down and go, “Who could help me unpack and pack some feedback that I get from others and help me understand it a lot better than maybe that initial like, ‘Oh my God. Really? '” That’s good advice is to find those people around you that you can turn to. And, also, find those people that when you feel that fear, that could just push you a little bit to put you in that uncomfortable zone because that’s where the magic is. Cara North: [00:36:43] And I will add a third element to that. I think it’s super important to have your cheerleading squad with you too. So, yesterday is a great example. I did a presentation here at Ohio State. And I live streamed it on top of presenting it here. So, I was a one-woman show. I was presenting in front of a crowd here at the college. And then, I was also on my computer trying to simultaneously livestream it, share my screen, so the people on the livestream could see it, the people could see it in the room with the different projectors going on. Cara North: [00:37:17] And there were things, looking back now, that I’m like, “Man, I should have done that differently. And I wish I would have done it and maybe set it up this way.” But the fact that I had people that I call my cheer squad that support me ferociously no matter what, and it’s reciprocated any time they do anything. I’m in there cheering them on. I share the things that they do on Twitter and LinkedIn. It really kind of helped me feel a little bit better about it. Cara North: [00:37:48] And for the people that didn’t know that, they’re like, “Man, Cara, look at you. All these people are really into it.” And I said, “Yeah, but, I mean, they did like it too.” But I mean, it also kind of gave a persona or feel that there was this really big kind of crowd behind me. And, again, while I did have people cheering for me, and I appreciate all the support of people that I get, I definitely reciprocate that because we’ve all been there where we feel a little bit awkward in something that we’re doing, and just want a friendly face or somebody that’s not going to make fun of us or give us a hard time if we goof. Cara North: [00:38:29] Because, to me, I think that’s the most endearing thing about presentations and talking. It’s about the authenticity of being human. I think a lot of times, people are very scared of that, especially people that I think get nervous about talking to people. They’re like, “Oh well. What if I make a fool of myself?” Guarantee, the only person that thinks that you’re a fool is probably yourself. That person probably doesn’t think anything about that because they have a hundred other things probably on their mind as they’re talking to you. So, don’t be afraid of that. Cara North: [00:39:09] Really, for me, I would never work another day of my life. Cara North: [00:39:44] Yeah. And one thing that when I talk to people, especially people that I encourage to get on social media like LinkedIn and Twitter, they say, “Well, I don’t know. (1), I don’t think I have anything to share; and (2), I don’t want everyone all up in my business if I’m on Twitter or LinkedIn.” And I always try to tell them that, in my mind, there’s a difference between authenticity and transparency. Cara North: [00:40:09] So, for authenticity, it is about that human element, what makes you you, like that deep hale. What’s your secret sauce? What makes you you? But with transparency, it is the degree of which you share something. So, great example, Pete, we have a pretty decent relationship. I mean, we haven’t known each other for a very long time. So, I may not tell you something about if my cat got sick or something like that, but I would definitely tell a friend of mine that’s had interactions with my cat. Now, does that mean I’m not authentic with you if I don’t tell you that? No. It just means that we have a different level of our relationship with a different transparency level in that. Cara North: [00:41:37] Yeah, 100,000 views. And it was just I had a picture of an e-learning module that had something on it about forced navigation, like a forced navigation tutorial showing you where all the buttons is. And my question was, “Why are we still doing this? Is this still needed in today’s e-learning?” It started this big conversation. Certain people were like, “Yes, they’re still needed for accessibility,” but yes. So, it really started this big robust conversation about it. And legitimately, I was just asking a question. Cara North: [00:42:08] So, don’t be afraid to get in there. And I feel like, especially for Twitter and LinkedIn, it’s a great way to start building your brand. Well, that’s the first thing somebody’s going to do after they meet you is they’re going to Google you, and you have control of that conversation. What you put out there, you can control the narrative of what they see. So, why would you not want to control that? Peter Margaritis: [00:42:30] Right. And the other thing I like about LinkedIn is you can actually post articles. You can write an article, you can post an article. In full transparency, when I was writing my book, I did not do as much posting on LinkedIn and stuff because I was putting this book together. So, today, for the first time, I put an article out there on LinkedIn, and I realized it’s been about two years since I had posted anything. Peter Margaritis: [00:42:55] And immediately, I got about six or seven people liking the article. And, obviously, I’ll be able to go back and look at the stats on the post, and see who liked it, and get some information on it. But that’s something that I’m starting to do, wanting to do it, at least, once a week, post an article in LinkedIn. And I think, it was only 300 words. It wasn’t anything. It wasn’t a page. And it was barely three-quarters of a page, but just enough to start getting back and helping to grow that network because there’s a lot of people on LinkedIn that read these articles. Peter Margaritis: [00:43:31] And the biggest one that I ever had was I wrote something about my son being a type 1 diabetic about the signs of it. And I posted it on LinkedIn. And I don’t remember how many views that it had, but it was over a thousand, at least, at the time. And that’s another way of getting that exposure out there. Cara North: [00:43:55] And, again, going back to the kind of conversation about authenticity and transparency, you felt comfortable enough to share that information because you thought there might be other people that would like to know about it. But it screams, “Hey, this guy is not just some robot with a picture with a tie on. This is a real human being that is dealing with a lot of different things in their life.”. Peter Margaritis: [00:44:17] A robot with a tie on. I like that. Cara North: [00:44:21] [Inaudible] has their nice little headshot with their fancy tie. Cara North: [00:44:30] Yeah. Even beyond that, you need to actually get to know the person, I feel like. Peter Margaritis: [00:44:33] Exactly. So, what I want everybody to do is one, go out and look at Cara’s LinkedIn page. And I’ll let her give you the answer to this question because she has that on her LinkedIn page. Cara, what is your superpower? Cara North: [00:44:49] Connecting people to possibilities. Peter Margaritis: [00:44:55] So, if you would like to connect with Cara, you can find her on LinkedIn. And it’s C-A-R-A. And then, the last name, North. Cara North: [00:45:03] The number 11, like a 11. 11 or 1 something finally. Peter Margaritis: [00:45:09] And. your Twitter handle is? Cara North: [00:45:13] @caranorth11. Same. Peter Margaritis: [00:45:16] @caranorth11, okay. What are the social networks? Are you on Facebook? Cara North: [00:45:22] Yeah, Facebook’s more for sharing pictures of my cat and same with Instagram. Cara North: [00:45:28] But I mostly use Twitter and LinkedIn. I actually do Facebook sabbaticals during the school year because I just don’t have time to keep up with everything. So, I say, “Hey, guys. I’m gone for a few months. I’ll be back in May,” so. Peter Margaritis: [00:45:41] Okay, cool. So, reach out to Cara. And think about this as you as you’re listening to this, whether you’re working out or on your drive to and from work, how can you begin to start growing your network? What do you need to do? And where could you get out of your comfort zone? And the challenge of this is, one, to find some quiet time at your kitchen table, and just take 10 minutes, and write some ideas down. But the key here is follow through. Follow through and make sure you do it. Peter Margaritis: [00:46:15] Cara, I can’t thank you enough for spending time with me this afternoon. It’s great. I love our conversations. I’m looking forward to more of them in the near future. And especially, I want to hear that day when you can say that, “I’ve got my doctoral degree, and you don’t have to call me Doctor. But just one time, you can call me Doctor.”. Cara North: [00:46:35] Okay, fair enough. Deal. Peter Margaritis: [00:46:40] So, thank you very much. Loved having you. And it’s been a great conversation. You gave us a lot of great nuggets. I hope my audience takes these things, and runs with them, and can improve their networking abilities far beyond their wildest beliefs. 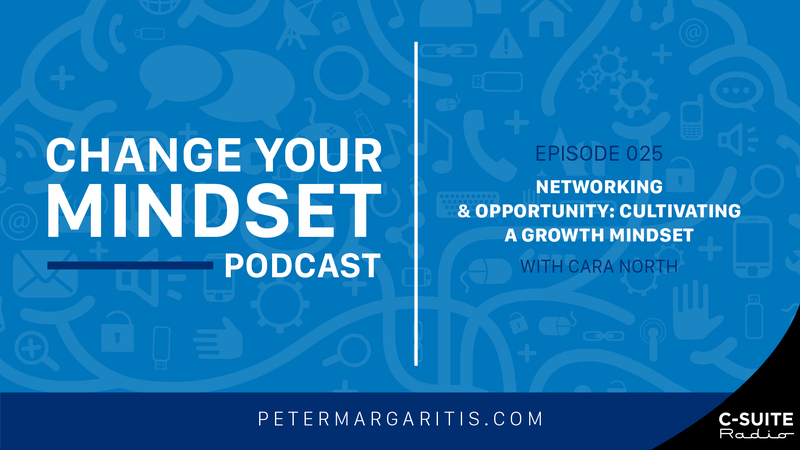 Peter Margaritis: [00:46:58] Now, that you’ve listened to this episode, what are your next steps in becoming a better networker? Is it changing your mindset? Is it not sitting or standing with your office friends and meeting new people? Is it breaking through your shyness and comfort zone to explore possibilities? Whatever it is, just do it. The one thing I do know about networking, if you want to grow your career or your business, you need others to help. And this is the part of the power of having a good professional network. So, get out there, network, and grow your career, and grow your business. Peter Margaritis: [00:47:36] Thank you for listening. If you’ve enjoyed this, podcast please subscribe and share this episode was a friend. Also, please visit www.c-suiteradio.com, and listen to the many of the outstanding podcasts that they have in their network. Bye now. Announcer: [00:47:59] Like what you just heard? Because it’s c-suitradio.com. C-Suite Radio, turning the volume up on business.